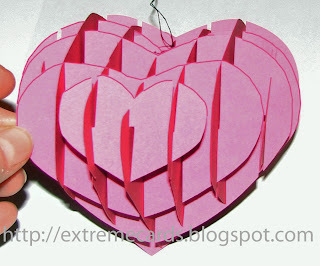 How to make a lattice style sliceform valentine heart papercraft, with optional hanging loop. Lattice sliceforms have an open center. 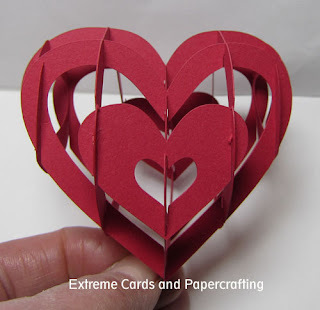 Compare it to the solid sliceform heart below. Click to download file set: Silhouette Studio, PDF, SVG (how to use my SVG files in Cricut Design Space). Files download for free. A huge thank you to the many readers who support my site with a small contribution when downloading. Pay what you wish for the tutorial and to support this site. Cut heart pieces. If you don't want the hanging loop, trim it off and discard. Identify the two sets of pieces: hearts 1-2-3 and cross pieces A-B-C.
Identify the top and bottom of pieces: the top of A is pointed and the bottom is rounded; outermost slots of B and C open at the top of the pieces. Assembly video appears below. Note that I only show how to add the first piece of each pair. Be sure to add both before moving on to the next pair. Begin assembly by slotting together heart 1 and cross piece A, at their centerlines, top and bottom. Add heart 2, front and back: slot the centerline slots, top and bottom, of heart 2 into the second set of slots on piece A. Add piece B, both sides: centerline slots of B go into the second set of slots on heart 1; and second set of slots on B go on second set of slots on heart 2. Add heart 3, front and back: centerline slots of heart 3 go on outermost A slots; and outermost heart 3 slots go on outermost B slots. 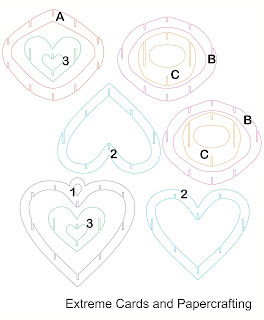 Add piece C: center slots of C on outermost slots of heart 1; and outermost slots of C onto outermost heart 2.